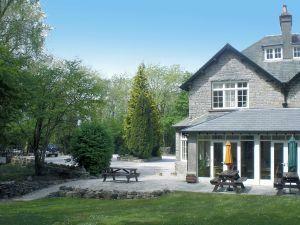 Woodlands Country House Hotel limits bookings to 2 or more days. All rooms overlook the gardens and woods. Prices are for Bed & Breakfast based on 2 sharing. All major credit/debit cards accepted. Full payment required at time of booking. Double limits bookings to 2 or more days. Twin room overlooking the gardens. Exit the M6 at J36 and head towards Windermere. After 3 miles, take the exit marked A590 to Barrow-in-Furness and Grange-over-Sands. After a further 8 miles, at a roundabout, take the first exit marked Grange-over-Sands. Immediately on the left is a country lane signposted to Meathop. Take this and continue for one mile, at which time you will see signs for the Woodlands Hotel & Pine Lodges. Everything was as we would have expected from a small hotel. Normal breakfast time was a bit late for us as we had time constraints, but the friendly staff kindly agreed to serve it earlier for us.